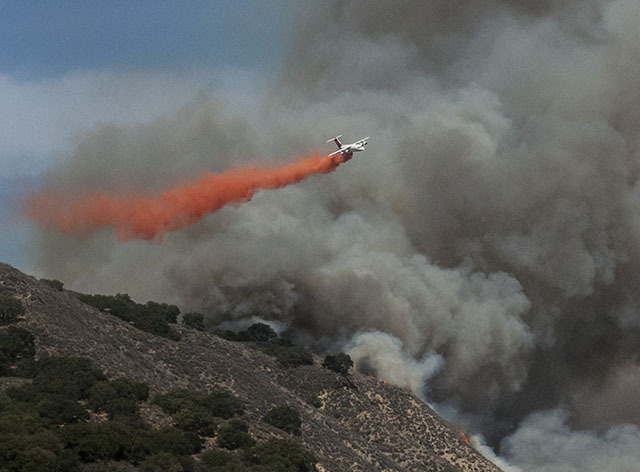 As of 6 a.m. Tuesday, the White Fire — which started as a five-acre brush fire Monday afternoon — had grown to 1,800 acres. Despite this growth, firefighters reported the blaze — which is headed in an easterly direction and away from human habitation — was 10 percent contained. Yesterday’s powerful winds died down during the night, temperatures dropped, and a thick blanket of moist fog settled over the back country, allowing a small army of about 538 firefighters from numerous agencies to prepare for today’s assault. Armed with shovels, chainsaws, and bulldozers, and backed by a small air force of six air tankers and seven helicopters, today’s focus will be one of perimeter control and keeping the fire on the north side of Paradise Road. The good news — at least as of this morning — was that there was no suggestion of south-blowing winds in today’s weather forecasts. Last night’s respite of cool weather and light winds is expected to burn off by early this afternoon. County Fire spokesperson Captain David Sadecki said he anticipates winds of 15-20 miles per hour with gusts up to 30. Yesterday, the air tankers had to be called down in the face of stiff winds, and Sadecki said that anything blowing harder than 30-35 miles per hour could pose a serious hazard for tanker pilots. Whereas Monday was occupied with evacuation efforts and structure protection, Sadecki said most of today’s exertions will be spent on perimeter control, all evacuations having already been conducted. Forest Service officials — who are in charge of the fire suppression effort — expressed gratitude at the orderly evacuations that took place Monday — Memorial Day — which marked the unofficial start of summer festivities. Between campers and residents, nearly 6,000 people evacuated, leaving the campgrounds eerily still and quiet. Tents and RVs had been left behind with some picnic tables set out for meals. As of this morning, the few Memorial Day flags hoisted — to honor those who fought the nation’s wars — hung limply in the non-existent breeze. 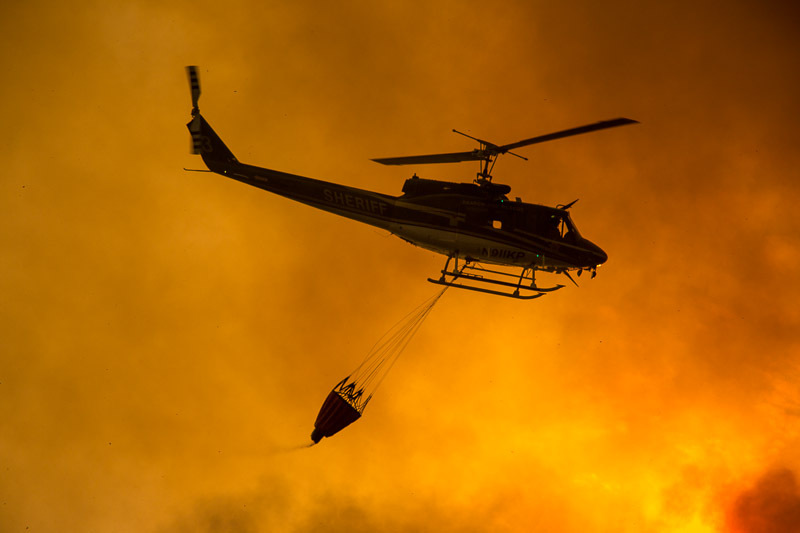 As soon as the fog lifts, Sadecki stated, the tankers and helicopters will begin bombing the eastern flank of the fire with chemical retardant and water scooped from nearby reservoirs. “The eastern side is open wildfire,” he said, “nothing but vegetation. … There are no houses, no improvements.” Despite the forbiddingly steep terrain, Sadecki said, no firefighters have reported any injuries. No homes have been destroyed, and to date, only two Forest Service vehicles have been burned out. They were parked in the Los Prietos campground, where the Forrest Service sets up its first incident command headquarters. 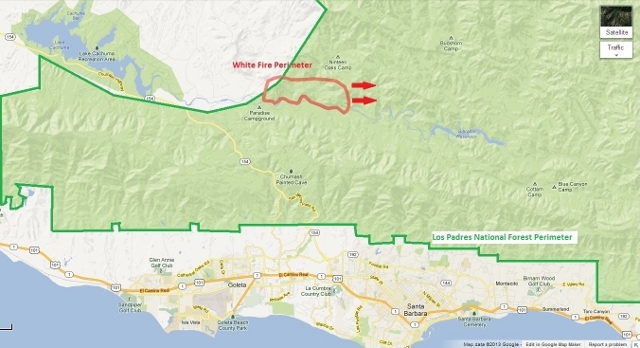 That area is too small, however, for the influx of firefighters, engines, and bulldozers from all over Southern and Central California, so the Forest Service will shift locations to the Live Oak Campground later today. Major fires like the White Fire are, by necessity, collective endeavors, involving a complex and massive dance of resources. 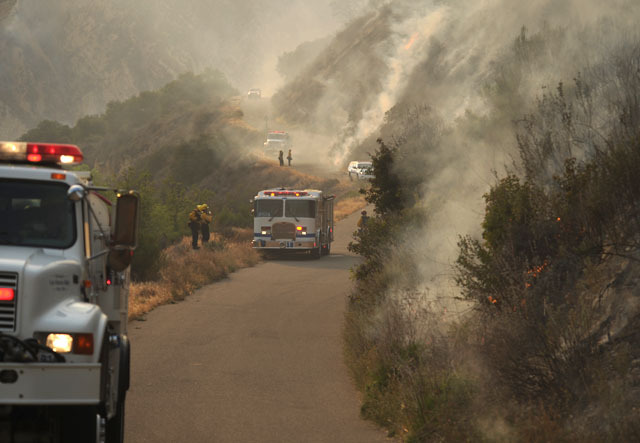 Just in case another fire should break out elsewhere in Santa Barbara County, for example, CalFire is sending five engines and 18 firefighters to the area to be on-hand. For people living along the South Coast, the good news is that the flames have yet to jump the Santa Ynez River or Paradise Road. Firefighters will be throwing everything they have to make sure it stays that way. The fear, of course, is that if the fire marshals its forces on the eastern flank and then is blown back by a shift in winds. No such shift in direction, he said, has been predicted. As far as persistent rumors at to what caused the fire — a careless camper dumping hot coals on dry grass — Sadecki said it remains uncertain what caused the blaze.